You are here: Home / Features / How Much Do Chickens Cost? Sounds like a simple question right? However, there are many costs to ‘having a chicken’, so today we are going to meander through the cost of the birds and their associated needs. 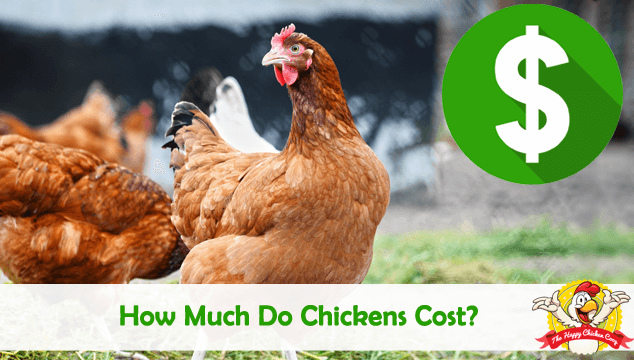 Roughly speaking your costs can be divided up into the chickens, feed, housing and maintenance or fixed costs. Without a doubt the most costly for most people is the coop. Ideally, you will have carefully planned exactly what your goals are with your birds. Are they backyard egg layers, will you be breeding and hatching, are you interested in showing your birds? If you know ahead of time, you can carefully contain your costs by shopping only for the things you need and pricing the best deals. Before we look at the cost of buying chickens, let’s first look at the cost of chicken coops. A brand new, secure and well-made coop will set you back anywhere from $500, to several thousand dollars depending on what you want. There are cheaper coops out there, but ‘buyer beware’. Many of those cheaper coops are badly made and the wood is of poor quality, flimsy and chemically treated. Folks who have bought them report that the wood starts to warp within a few months and the coop is almost un-usable by the second year. Another problem with many readymade coops is the optimism of the advertiser. They will often say ‘big enough for x number of hens, when it plainly isn’t. Large breeds will need 4 square feet of space, per bird in the coop, make sure there is enough room. Tight quarters can lead to anti-social behaviors such as plucking and pecking, especially in the long winter months. It is better to have a little too much room than not enough. Inspect the coop before you buy, if you aren’t sure what you are looking for take a friend along – preferably someone who already has chickens and can give you the benefit of insider advice. If you are handy, you could easily build your own from scraps and scavenged items. 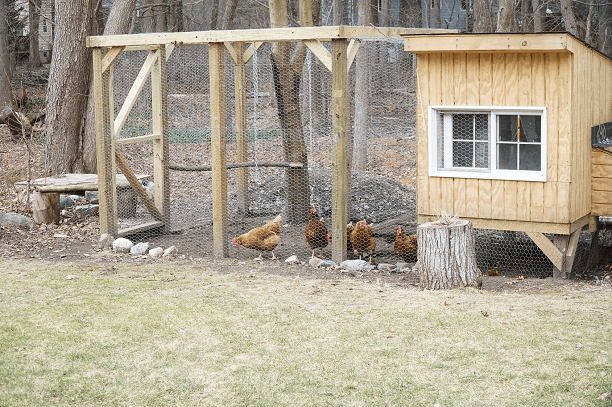 A homemade sturdy coop will cost you less than $250 for sure. We even have coop plans available on our website here. Things like drinkers and feeders and any other things like bins to store the feed in and bedding. Chick drinkers and feeders are around $5.00 each, but they will soon outgrow these and need ‘big girl’ containers. The style that you buy will depend on how many birds you have. If you intend to have more than six birds, you will need more than one feeder and drinker. A plastic five quart drinker is around $5.99; a metal five gallon drinker around $34.99 and a heated drinker for winter use is usually about $45.99. A good plastic feeder will cost you $11.99 for a seven pound container up to around $20.00 for a metal thirty pound container. Buy the size that is reasonable for your flock. Hanging a thirty pound feeder for six chickens will lead to moldy, wasted feed. Many people use a metal trash bin to store feed in as it is rodent proof. I have used a large plastic tote for many years now and it works just as well. I check it over frequently for signs of rodent damage. A metal bin will cost $20.00 and a 20 gallon plastic tote around $7.00. Bedding has many different forms – pine shavings, hay, straw etc. A small square bale of straw costs around $3.50 and I will use about twelve bales per year. I choose straw because it is cheaper than the other selections out there. In the Fall I also gather dry leaves, pine needles and any grass mulch that is dry and I bag these up in paper sacks for use in the coop over the winter months. It can be used in conjunction with straw or alone if you have a large supply. Now you’ve bought your coop and accessories you need to actually buy the chickens! First you need to decide if you are buying eggs, chicks or hens? The vast majority of people buy chicks. They are readily available from the feed stores, online or paper catalogs and even the local farmer! A chick can set you back anything from $3.00 to $100.00 – depending on the breed you want. Be sure to get your chicks sexed if you are zoned for roosters. If this is your first time starting out, I would recommend chicks that are hardy and require minimum input of care. 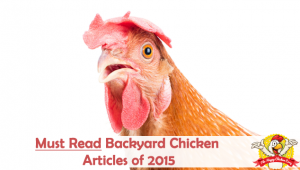 Rhode Island Reds, Speckled Sussex, Barnvelders and Wyandottes all fall in this category. Buying chicks is a great way to get your birds, especially if you want to bond with them and make them outdoor pets or simply want friendly hens. However, they do entail a bit of work and a few more dollars to care for them. 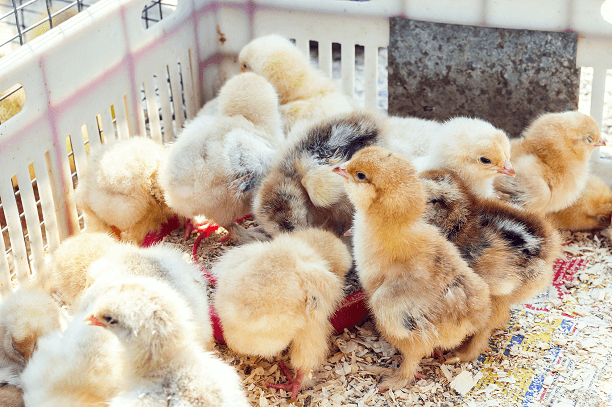 If you are buying ‘started pullets’ it is a little more expensive since the breeder has done most of the rearing for you – they will cost anywhere from $5.00 and up. If the breeder wants significantly more, ask why (especially if it’s a common breed). The down side to started pullets is that they tend to be less friendly with you since they haven’t bonded with you from the beginning. Eggs are possibly the worst option for first timers. You will need an incubator to begin with – if you know someone who might lend you one, ask them as it will save you a minimum of $100.00. Hatching eggs can be bought for a couple of dollars each. This is a great school room or 4H project for the kids, but requires time and attention to keep the eggs at the right temperature and humidity in order to hatch healthy chicks. There is a different feed for each stage of development in chickens. It is important to follow the recommended feed regime and not try to skimp on cost. What you many save in pennies will cost you in chick development and eventual egg laying. 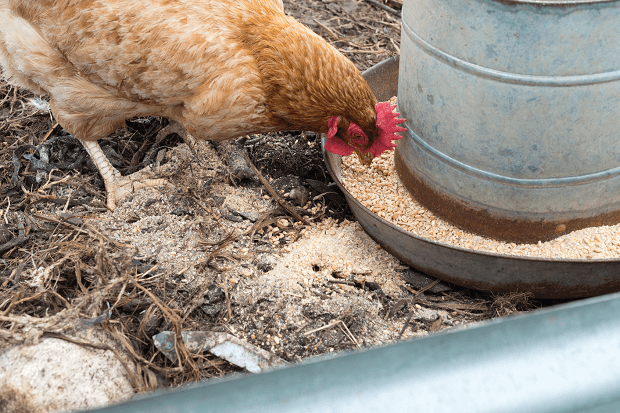 An average adult hen will consume about 1/4lb of feed per day, which equals 1 1/2lb per week. A fifty pound bag of feed costs around sixteen dollars where I live – it may be different in your area. Bear in mind too, organic feed is more expensive. In addition to feed is the cost of oyster shell for calcium intake. A five pound bag will cost you about fifteen dollars. However, this should last a long time, especially if your hens free range. Please don’t try skimping on feed. It is very important that hens have the correct diet for the health of the hen and production of those beautiful eggs. Electricity, water and your time can be considered fixed costs. Your electric costs should be negligible in the summer and fall months, rising in the winter months and on through the early spring. Much will depend on whether you put an extra light on to encourage egg laying and if you are hatching or brooding small chicks. Water too will vary, with your hens consuming more in the hotter months. Lastly – your time. How much time do you spend with your birds each day? Many of us spend a great deal of time with them, looking upon it as a labor of love. If you intend to run a business you will need to price your time. None of us will get rich keeping hens, but you should consider your time a premium and ‘pay’ yourself accordingly. If you manage your chickens well and have a market for all their products (including manure), you could make a reasonable profit from them. The initial outlay to set up your hens is the costliest part. Once you have all the basic necessities, you will not need to buy them again (unless you are expanding). If you are able to make many of the items yourself (feeders, drinkers, coops etc. ), you are way ahead of the game. It’s actually fun to see how much you can save by being inventive! If you are looking to know that your food is pure, with no additives, hormones etc. and that the birds are treated humanely, this is the way to go and is the driving motivation for many folks. Your hens can be a huge source of enjoyment to you (priceless) as well as paying for themselves and perhaps making a small profit for you. 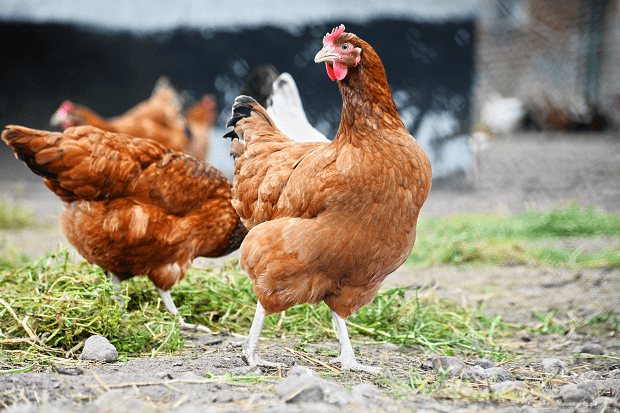 If you want a get rich quick idea – keeping chickens is not it! It will take at least twenty weeks or so before they start to lay eggs for you, so patience is definitely required. We have 11 chickens in a coop for 6. We bought 6 hybrid chicks. Three of them died. So my husband bought 8 Reds figuring the same thing would happen. Hybrids were sexed. The reds weren’t. Got them late March/early April, but No one is laying any eggs yet. Waiting to see how many hens we have!! Any suggestions? How old were they when you got them? Sounds like they should be coming up to point of lay anytime now.. When you get enjoyment from something or someone pet or human the cost doesn’t matter. The little thongs like getting eggs or compost for your gardens or a place to throw your scraps to cut food waste. Who cares about cost. You can go and talk to a pet there is no judgement so again cost doesn’t matter. Most helpful advice . I have 4 chickens and I bought a ready made coop from Tractor Supply and it does look flimsy but adequate. I bought Red rockets for $25 each. Did I pay too much? Are they point of lay 🙂 ? Thank you for writing this article! I am a first timer and my hatching eggs are due in 2 weeks. 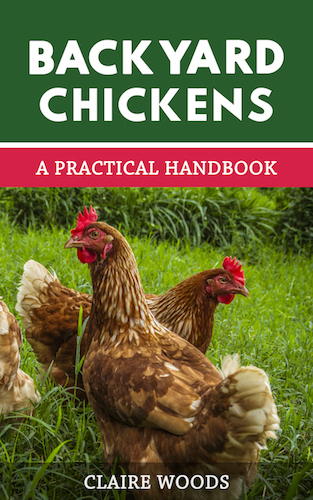 As I prep everything for my 6 chicks arrival this is a great resource! Im starting out with 2 each of Wyandottes, Speckled Sussex and Australorps. I ordered a good amount of chick starter feed, but am unsure how long to use it for, and how to transition to the next feed. Do you have any advice? Other than the obvious of pick up daily which I can’t, do you have any suggestions as far as taming the flies? I have 12 young chickens, not quite old enough to lay, I clean their coop about every 2 weeks because the shavings aren’t cheap, but they’re getting bad. It’s almost middle of July in CO, dry as a bone. Thanks! I use old fashioned sticky fly papers – works a treat! As long as they are high enough that the chickens don’t get stuck to them of course. I really don’t care about the cost. I got my first backyard chickens this year as a mental therapy after losing my husband from cancer. These girls and boy have given me so much joy. I think I cannot put an amount of money on that. Yes, the eggs will be a plus and the meat and broth from the roosters I had to cull are also a plus. These chickens have forced me to get out of bed on mornings when my grief would have overtaken me. They also forced me outside in the sunshine to give them fresh water and food. They have been the best thing I have done for myself. When they come running to me, my heart is happy. Yes, it costs a pretty penny to have them. But they take my mind off my grief. It isn’t all about money. I’m so sorry to hear about your loss Anita, but I’m also delighted to hear about how close you are to your chickens!